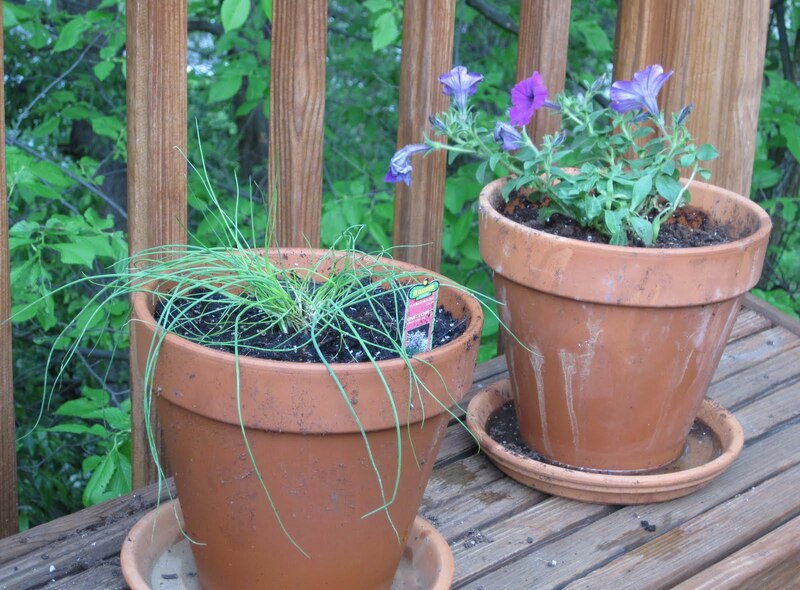 Last weekend, we finally bought some fresh herbs to grow on the deck. But first, a photo of one of our fat squirrels: He doesn't look as fat in the photo as he did out the kitchen window. He was huge - clearly there's an abundance of squirrel food in our backyard/woodsy area. 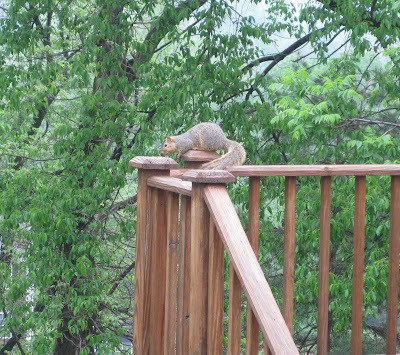 These squirrels, they get pretty cozy on our deck sometimes. They aren't too frightened of the humans inside the house. I have a wee fear that someday we'll leave the deck screen door open and one of these buggers will sneak inside and wreck my house/terrorize me! Back to the herbs! This year's herbs include mint: Chives, and a pot with a 'leftover' petunia (we bought petunias for the front planter): Basil, which we started from seeds on Easter. It's growing, but it's growing a bit more slowly than I'd like. I'm thinking we might need to go back to the store and buy a basil plant and then next year start growing it from seeds in March. 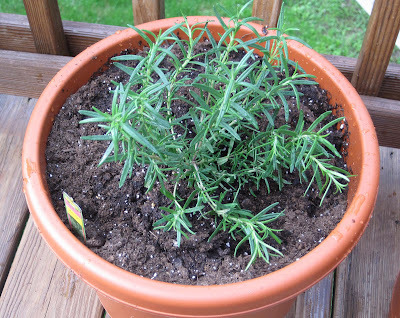 Rosemary: I cannot wait to try this rosemary in our lamb marinade or on roasted potatoes. And thyme: Plus the parsley we got in the CSA this week. Right now, it's on the kitchen window sill, waiting to be transplanted into a bigger pot and placed on the deck. The rosemary, chives, and thyme are new this year - we've never tried growing them before. 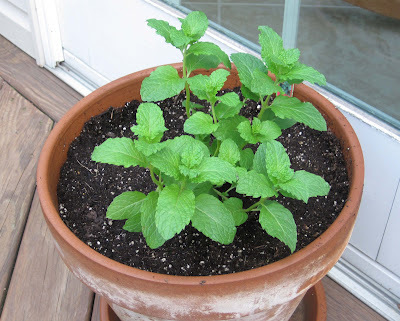 This year we gave the mint a bigger pot because we think it didn't like the smallish pot last year - it didn't really thrive the way we expected after all the stories we've heard about how mint can grow 'like a weed' and 'take over a garden' if you aren't careful. Last year we also had pots of oregano and dill. Our dill got parched and dried out/died about 3 weeks after we got it, so we decided to not try it this year. 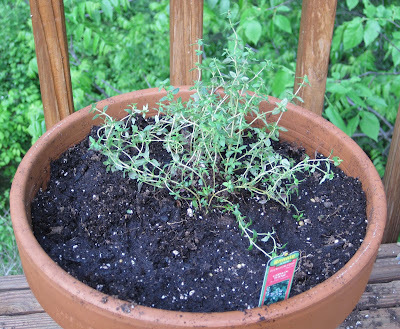 We had success growing oregano, but we found that we didn't really use a lot of the fresh oregano, so we decided to not grow it this year. We do get bunches of it in the CSA periodically, so hopefully the CSA will satisfy our fresh oregano needs. I can't wait to start using our herbs! Hopefully, the rain isn't drowning them in their pots on the deck. 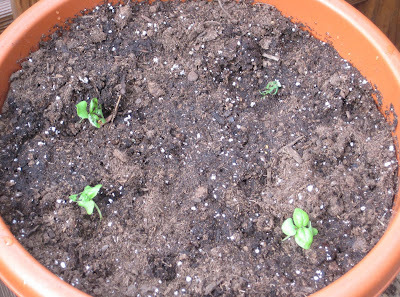 We just got the herbs and transplanted them into pots and we transplanted petunias into the planter and into some pots. I always feel like the herbs and flowers are my fragile babies for a week or so. I fret if it's too windy or too rainy or too something and peer anxiously out the window to make sure everything is OK!!! We even waited a couple extra weeks this year because the past two years we always managed to plant our herbs and flowers early enough to be worried about those last few frost advisories. Then we had to scramble to protect everything, which is a bit of a pain with pots on the deck and more pots and the planter in the front. Thyme! Let me tell you a little story. Three years ago I bought a small thyme plant (maybe 4 inches tall, 4 inches in diameter) and gave it a home in the center of my not-super-high-quality city garden in front of my apartment. That first summer I took great care of it, but stopped watering it at the end of the summer thinking it'd die with the rest of the flowers. Wrong! It has continued to flourish and is now over 2 feet in diameter! 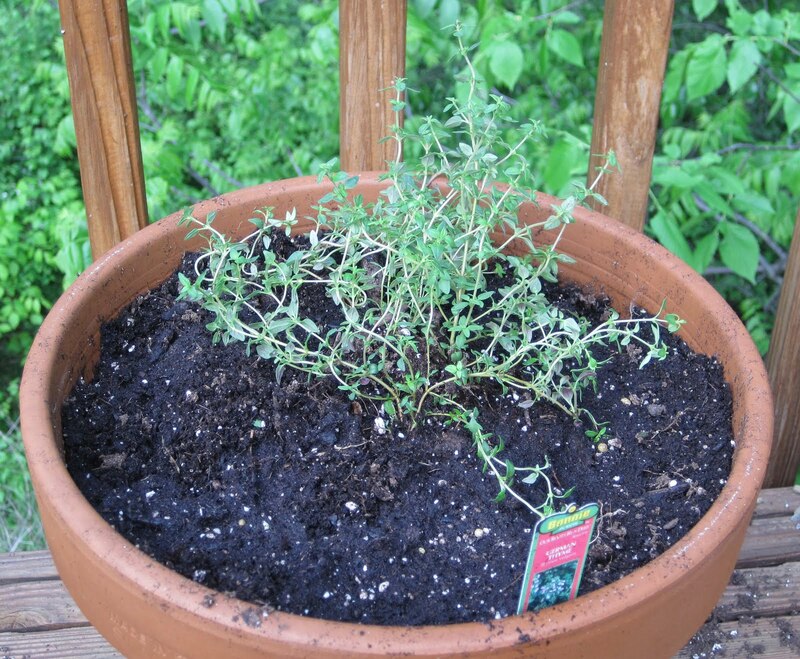 Thyme for all :) I hope yours is just as successful!